Qualcomm announced its flagship Snapdragon 821 processor this week and it's already found its way into a smartphone. Introducing the Asus Zenfone 3, the latest handset to grab the "most powerful phone in the world" title. It's off to a strong start with the Snapdragon 821 chip backed up with a whopping 6GB of RAM. Currently the only other phone with that much RAM is the OnePlus 3, which sports the slightly less powerful 820 processor. There's a 23MP camera with laser auto-focus and fingerprint scanner round the back, while up front a 5.7-inch display has a slightly disappointing full HD resolution. 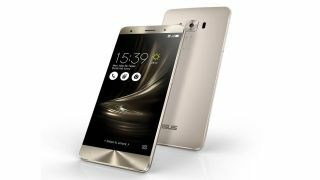 Considering the Snapdragon 821 chip can support 4K resolutions it's a shame Asus hasn't at least gone half way towards that with a QHD panel to rival the LG G5, HTC 10 and Galaxy S7 Edge. Another plus point, however, is the option to get 256GB of internal storage. Until now 128GB has been the storage ceiling for the majority of phones, but this increased size gives us a glimpse of potentially what's to come in other phones this year. The Zenfone 3 is unlikely to take the world by storm, but the Snapdragon 821 processor will feature in more high-end smartphones this year. It's currently being linked to the new Nexus handsets, and with rumors of the Samsung Galaxy Note 7 and Sony Xperia X2 doing the rounds Qualcomm's new chip may well be rather busy.